Care2 Healthy Living | What Happens When You Hold in a Burp? We’ve all done it. 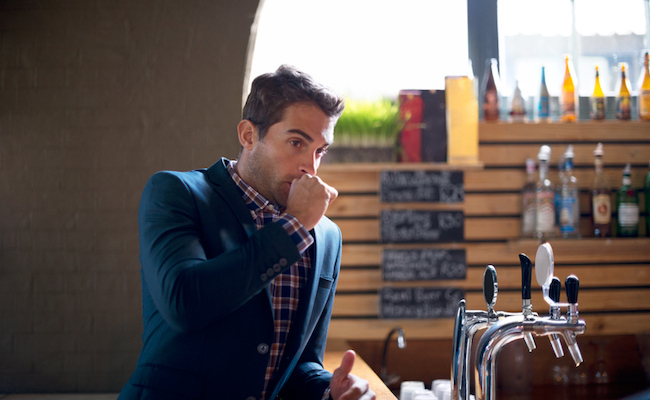 Whether you’re in the boardroom or the bedroom, we’ve all held in a burp for fear of smell or noise or both. In American society, we’ve been taught that it’s rude to burp out loud, especially without excusing yourself. But what happens when you hold in your burp? Surely it can’t be good! Let’s get down to basics. Burping occurs when you swallow air. You can do that one of several ways. A burp is likely to follow after drinking carbonated beverages, chewing gum or eating food. Any time you take in oxygen, carbon dioxide and nitrogen through the mouth and into the stomach, your body burps to release it. When the air stays in your stomach, it will naturally rise to the surface. As it comes up to the surface, it looks for an escape through your esophagus and out of your mouth, which is essentially a burp. Most of the gas that comes from this direction is odorless. Except when it’s not. You’re most likely to get a stinky or smelly burp after eating smelly foods. This can be especially true after eating deeply-seasoned dishes, like Indian food or BBQ. But what happens when you keep yourself from burping, smelly or not? Letting the burp out at the top end may be a better choice in the long run. If you decide you can’t bear to let one escape, then it may try again as a burp. It may cause some indigestion for a while, and eventually, the gas enters your small intestine. The burp you held in makes its way through your intestines to come out the other end as flatulence. If it decides to hang around for a bit in your intestines, then it can cause bloating, which can be uncomfortable. Soon, it will need to make its escape from somewhere. Whether you do it in the moment or save it for later, you will need to release that gas. If you don’t, then gas builds up in your digestive tract, which can cause very uncomfortable bloating. Gas pains are no joke. These pains can have you curled up in bed, rubbing your belly and downing Gas-X. Even though it can be embarrassing to belch in front of others, if it’s your only option, then do it. Otherwise, you can always step away for a moment (or a quick lap around the block) until you’re able to relieve your gas. Gas production is a normal part of how the human body functions. While kids may think it’s funny, adults are notoriously shy about it, at least in America. Honor your body by taking space, if needed, to burp regularly and to avoid the pains of bloating. Gross. Here’s What Happens When You Hold in a Fart.